Specifications: 6.5 Amps, Keyless bevel adjustment, Quik-Lok blade change, T-shank blades, 1" stroke, 4- position orbital cutting action, 0-3000 SPM. Weighs 6.4 lbs. I am in the middle of a major home renovation project. I am choosing to buy tools that last beyond the immediate job ( like my last set of tools - dept. store specials). When I got the saw I inserted one of the t-shank blades that came with the saw and hit the trigger. WOW! My electric craving knife is a bludgeon compared to the finesse and control this jig saw has. My old dept store jig saw bounced around, vibrated and bucked once I turned it on , even worse when I started cutting. The Milwaukee Jig Saw was rock steady and smooth. I have a number of projects where fine precision cutting is required. One of these projects was to re-do the Master bath in my house. This meant totaly new sinks and countertop. After researching the best way to cut the countertop to size and to cut the openings for the sinks. The tool that was reccomended to me was the jigsaw. After researching and holding/using all of the various top end brands (Bosch, Freud, Ridgid, Makita, Milwaukee) I narrowed it down to the Bosch or Milwaukee. The Bosch was real close but the Milwaukee won out. The Milwaukee cut through the countertop with ease. The anti-splinter device was installed however I also taped all of my cut lines. The anti-mar foot was perfect on the counter top and left NO scratches behind. I used a blade designed to cut ceramic tile and it worked well in the Jig saw. I did not rush the saw and let the blade to the work. I tested the saw out on what would be waste to determine the proper blade speed and proper force to practice (Counter tops are real expensive ;) ). Once I was confident that I had the right settings and force, I cut the holes. The saw preformed flawlessly. The saw does have a port for dust colletion however you may need to buy the accessory kit to fit your particular shop vac. But for me the included dust blower worked fine as I made my cuts. The Jig saw also provides attachment points for a t-square howerver that is sold separtely. But both of these items are designed to fit in the case. THe case is designed to be a "kit" case meaning that the basic tools required for more jobs will fit in the saw. One of the major points I liked about the Milwaukee was the tool-less operation of the saw. To change a blade move a lever, to change the angle of the base move a lever. The speed control worked as described and once I figured out how to adjust the speed and the ortibiting of the saw to my work, I realized the value of the system. My countertops look great with smooth edges. And best of all I have a tool that I have complete confidence in for the next precision cutting project. Smooth cutting, well balanced. Cut off the tip of my left index finger and didn't even feel a thing. Nice that it came with it's own case to protect the saw. Better than my Dewalt which is probably in some landfill now.
! ! ! WAOOOO ! ! ! Friends let me tell you something, this is the best jig saw ever made. Works great, accurate, smooth cutting, powerful motor. Nothing bad to say. Thanks to Amazon for the fast delivery. I `m definitely going to do business again. I was trying to decide between this and the Bosch. this one was made in the Czech Republic, the Bosch was China (maybe Taiwan) so I went with the Milwaukee. Smooth. powerful a real pleasure. just silky. long cord id nice also. As I looked for a new jigsaw, each one had some problem or other that made me keeep looking. Some of the cheap-o brand saws actually seem to have better features and functional design than the name brand tools! But this Milwaukee has it all. It's well engineered, has plenty of power, runs smoothly and precisely and has all the features that I think are important. It's a heavy saw, and the weight contributes to the smoothness - the added weight isn't really a drawback at all. I particularly like the tool-less blade change, the ample power, and the very solid and precise bevel adjustment. All the controls work easily and well. The built in blower to clear sawdust from the cut line is a nice feature, and the LED light is actually useful. I also like the plastic no-mar sole plate cover, which many other jig saws also have and is a very nice feature. The long cord is a rarity these days when most power tool cords have gotten shorter. I have to say that I mostly don't use the anti-splinter shoe, since it makes the blade a little harder to see. With a fine blade I can cust across the grain on oak plywood (particularly splintery stuff) with little/no splintering even without the anti-splinter shoe. I also bought the edge guide/circle cutter - haven't used it yet but it fits ok and seems like a decent accessory - although too pricey. I have several Milwaukee tools and have never been disappointed. You can't go wrong with Milwaukee - great, heavy duty tools but also well engineered and designed to be a pleasure to use. As expected, typical Milwaukee quality. The heft of this saw takes a little getting used to, but just as with a handgun, weight buffers recoil. The weight makes this baby smoooooth. My tools are used for personal home improvement use, but I appreciate quality. This is the sixth Milwaukee tool I have purchased. They cost more, but I continue to choose to pay the difference. I love this saw. I can't afford a SawStop table saw or a Laguna bandsaw, but if this isn't the best jig saw out there, it's got to be darned close to it. My previous jig saw was a Freud J85, and the difference is like night and day. First of all, the fit and finish: This saw is made with precision. It cuts square and doesn't drift when cutting along a straightedge (like the Freud used to). Second, the LED light and the dust blower make it easy to follow the cut line (the Freud piled the dust right on the cut line, even if the cumbersome dust collection attachment was used). Third, it is balanced well (whereas the top-heavy Freud was just too big for it's base and would tip over backwards with half a chance, especially with the dust collection attached). The tool-less blade change is positive and effortless (actually, the Freud was OK there, too, one of it's few virtues). Let me add one more 100% 5 star rating to this list. 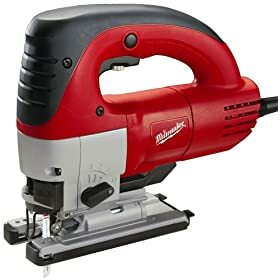 I thought about buying the Bosch jig saw, because of it's reputation and because a lot of people use it, then I thought I would look and see what Milwaukee had to offer. So I read the specs and reviews on this Milwaukee on here and at other tool sites. I have several Bosch tools, and several Milwaukee. One thing I can tell you is Milwaukee tools have never ever let me down. If there were one reason that I would suggest you buy this tool it is because of the light. It really does help, and when your eyes are getting older, as mine are, and yours will also some day (it creeps up on you, just wait) this will definitely help you on accuracy, visibility, resulting in greater accuracy and quality craftsmanship. Another reason is the warranty on this. 5 years. That shows the confidence they have in this tool. One (subjective reason) I bought this was due to the fact that Bosch has a large corner on this market, and many buy the Bosch perhaps without further thought on another choice. I have used both the Bosch and the Milwaukee. This Milwaukee cuts very smooth, has a great feel, and easy control, and feels more solid than the Bosch. Again, the light is a plus. And one more thing, I can tell my tool from the others on the jobsite. Everyone has a Bosch, and they can no longer say theirs is "the best." And think about it, they say that having never tried another comparable competitor. This tool is very high quality, very solid, very smooth, and it's a Milwaukee. It's cuts are awesome. No kicking, chattering, loss of control, or hard maneuvering. It cuts nice square through cuts, even when doing intricate manuevers. Give this one a shot if you've considered the Bosch. You will be completely satisfied and won't miss a thing if you do. If anything buy it for the light it has. Smooth full curves, sensitive controls and lots of voom! Wow! What a buy. This saw is worth much more than I paid. It is a very impressive tool and works great. I have a friend who is a professional contractor and he looked it over and was very impressed with it. When I told him what I paid, he was just amazed. Hands down the best jig saw I have used. Vibration is significantly less compared to other jig saws, you have much more control. The features are well done, the blade change is simple and the angle adjustments are tight. If you are in the market for a new jig saw, I highly recommend this one. I chose the Milwaukee jig saw over the Bosch because I have heard that the bosch has problems with square cuts. If square cuts are a priority for you this is the jig saw for you. It runs extremely smooth and it cuts through hard wood like butter, just let the saw do the work.